So Utah’s weather has been so weird we have only had one big snow storm this year which is beyond normal for Utah, I mean we are known for our snow so the fact that is is February and it is 65 degrees with no snow is a little weird. But hey my motto is if there is sun there is a sundress! I am totally okay with sundresses plus I was able to accessorize it in a super cute way that I couldn’t get away with in the Summer. I love when the weather causes you to get creative with your outfits. Hope you all have the a bomb rest of the week! Honestly, you are just the CUTEST! I love everything about this look!! Oh that is so sweet thanks! I appreciate you stopping by! 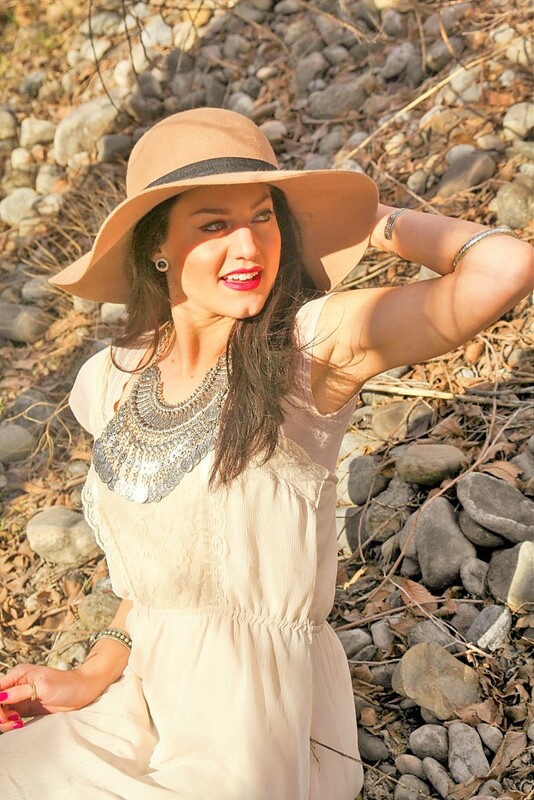 What a fun way to style an ordinary sundress! Great way to wear it in that awkward transition season (where it could be winter tomorrow, or it could be spring!) Do me a favor and send that warmth to the East coast please! What an effortless, pretty outfit! That necklace is just outstanding. What a stunning piece! Thank you I love it so much! I have to be conscious of how many times I wear it, LOL dont want to over kill it. Thanks for stopping by! This is such a gorgeous look! Love how you built on a sweet, simple dress. I love all your jewelry, especially that necklace! Thank you! It is definitely one of my favorite pieces! This look is so beautiful and I am so jealous of your weather there! 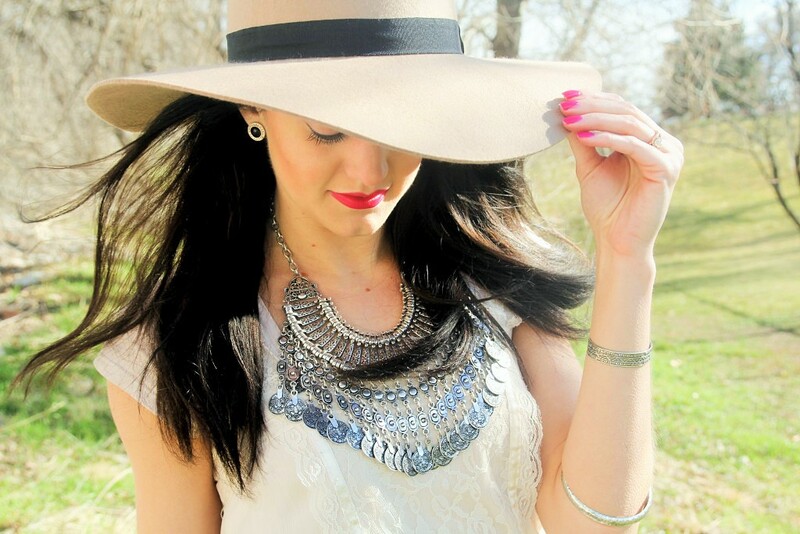 That hat is perfect and I adore that gorgeous necklace! I know right it is a wardrobe staple. Thanks girl! really cute look, adore the necklace! These photos are stunning! You are gorgeous my dear!! Oh you are so sweet, thanks! Thanks girl! I appreciate the love, I am excited to check out your blog! I love this whole look, but that necklace is especially gorgeous! I love it! Thank you so much! Yes it has definitely been a fan favorite! Thanks for stopping by! Thank you that is such a flattering compliment! I know I am really loving the boho vibe these days. Thanks for stopping by! Gorgeous photos! I love how you styled this look. So pretty. The accessories are amazing. Thanks girl I really appreciate it! I know it is a hard piece to put away! Remarkable photos! Amazing! I love the outfit with the over the knee socks! Thank you, I love it. It is heavier then most necklaces but it is not uncomfortable. I have a hard time wearing necklaces because I don’t like stuff around my neck, weird I know, but this necklace is one that surprising does not bother me at all! 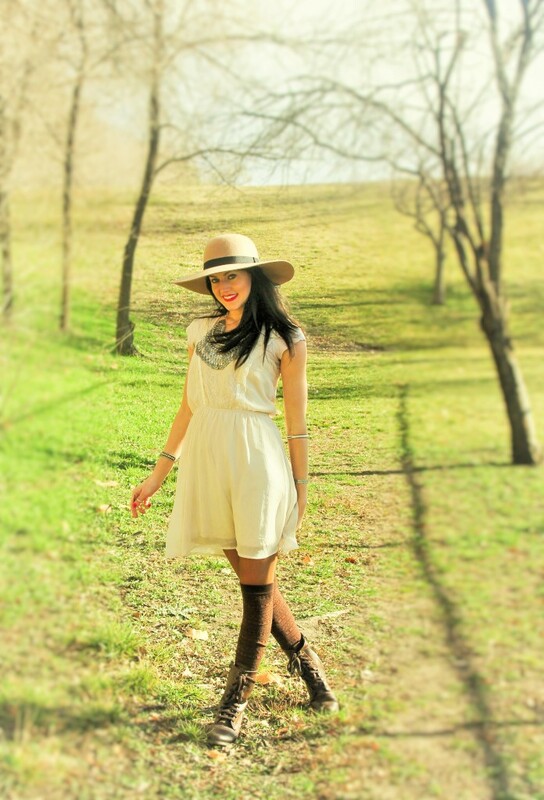 Thank you for visiting my blog, you’re so beautiful and I love what you’ve styled here. Super cute. I followed your blog on wordpress , bloglovin as you’ve mentioned on my blog:). would love to have you as one of my follower as well:). Hope to hear from you again soon! Thanks girl! I am looking forward to your next post. Thank you that is so sweet! This look is very beautiful :-). I love it! Thanks again for stopping by my blog! You look amazing in this, I love those socks! It was my pleasure I loved it! Thanks hun! This look is so boho chic perfection, I’m dying!! Love looks like these, thanks for the inspiration! 🙂 Your blog is fantastic!! Oh you are SO sweet! Thank you!